IMGP8815.JPG, originally uploaded by lisabagg. It snowed Sunday (don't get me started). 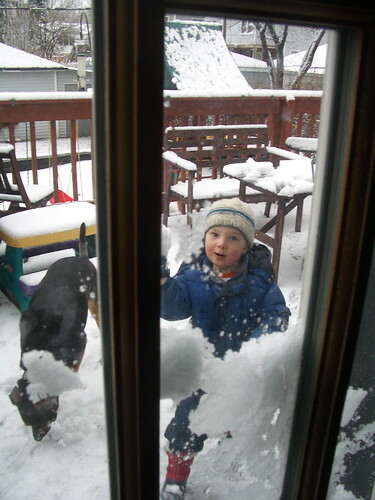 Finnie really wanted to play in the snow, but it was too cold for Cormac. Solution? A one-way snowball fight with us inside, and Finn outside with Santos. nataly.JPG, originally uploaded by lisabagg. 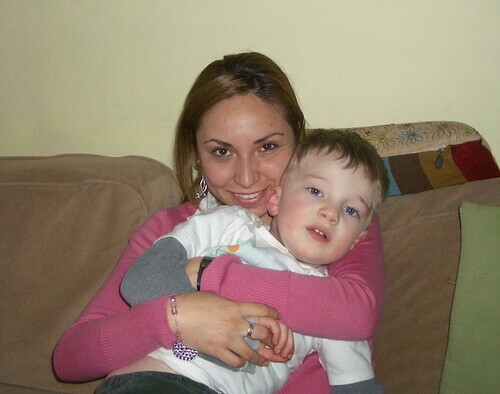 Finn's caregiver, Nataly, headed back to Peru this week. We all love beautiful Nataly, but none more than Finn. Clearly in this photo, you can see that he's having a hard time with his goodbyes. He was always in Nataly's lap, snuggling, giving kisses, holding hands with her, etc. He insisted on making her some jewelry to remember him by (seriously, it was all his idea). You can see the bracelet in this photo. We will miss Nataly, but have hopes that she will return to Chicago, for good! swing3 from lisa hazen on Vimeo. Yesterday, Cormac was fussing in the car. And as soon as Finn started talking to him, he started giggling. These two are just too cute together. When your name is "Finn" (or "Cormac" for that matter), you do have a real legitimate claim on St. Patrick's Day. Daddy took Finn downtown on the train to see the Chicago River being dyed green and the parade. As you can see, they had a glorious time. Brothers., originally uploaded by Daddy Shawn. Poor Cormac. 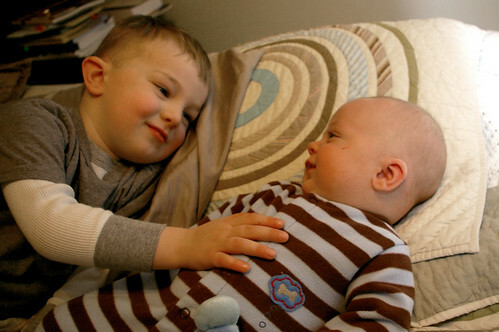 He's going to look back at this blog and see that his brother's milestones were blogged almost daily, with an almost breathless recap of each change. Now I'm lucky if I post once a week. Following are the milestones I've missed posting this month. * It should be noted that "by longer stretches" I mean that he's not still getting up every two hours. Which makes four months go by really slowly. He is now sleeping between 7pm and 10:30, 10:30 - 2:30, and then (if we're lucky) 2:30 to 5:30 or 6:00. If we're (really) unlucky, it's more like 2:30 - 4:00, 4:00-4:30, 4:30 - 5:00... You get the picture. Cormac just had his four-month appointment, at which his doctor declared him "simply fantastic" (I totally agree). He's a healthy (chubby) 15.5 lbs., and measuring 26.5". That puts him squarely in the 75% percentile for everything, which is a nice, comfy place to be. Everyone always wants to know how Finn is doing with his little brother, and the answer is wonderful--better than I ever expected. Cormac's favorite person is Finn, and it is absolutely the cutest thing in the world to see these two together. Cormac starts this adorable giggle when Finn starts talking to him. Then, Finn will say, "Did you hear that? He just said, 'Where'd my big brother go?' Oh, Babes! I'm right here! Your big brother is RIGHT HERE. Oh, you love me, huh? I love you TOO, Babes!" And this usually goes on several minutes. In fact, I anticipated at least some hostility toward the baby when he arrived. 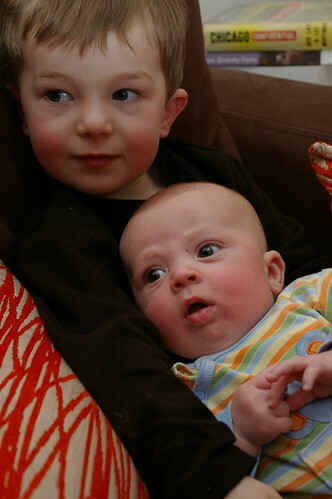 But Finn has been unfailingly kind and dear to his little brother. This is not to say that Mama and Daddy did not bear the brunt of said hostility, but I'd much rather have him direct it to us. Finn even gives Cormac his special blankie, "ni-ni" to snuggle. And let me just tell you, not just anyone can touch "ni-ni". At least I'm not just neglecting Cormac's milestones. Finn also blew us away this month as he's starting to sound out words. He read the word "banana" off a menu, which I think is pretty significant for a three-year-old. cormac coos from lisa hazen on Vimeo. OK, this is just a full minute of Cormac cooing. But how cute is he? go baby, go baby... from lisa hazen on Vimeo. I seriously don't know where he got this, but every time Cormac starts kicking in his bouncy seat, Finn starts doing this funky dance where he sings, "Go baby, go baby... Go go go baby." Unfortunately, he seems to have inherited the dance talents of his parents. That's his friend, Cal, dancing with him. And you'll see that it ends with him kissing the camera. * I'm still figuring out how to edit these videos, so it's a little grainy. Bear with me. 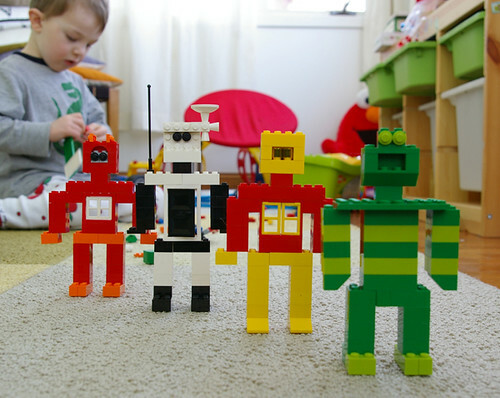 lego_robots, originally uploaded by lisabagg. IMGP8035.JPG, originally uploaded by Daddy Shawn. I promise more regular posting soon! This should tide you over.